Cobalt–chromium everolimus-eluting stent (CoCr EES) is associated with a lower rate of stent thrombosis even in patients with ST-elevation myocardial infarction (STEMI). However, the time-serial changes of endothelial coverage of the stent struts in the extremely early period have never been reported, especially in patients with STEMI. 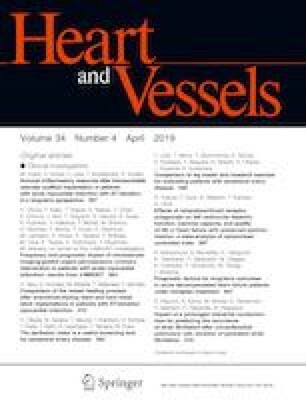 The aim of this study was to compare the vessel healing process between CoCr EES and cobalt–chromium bare metal stent (CoCr BMS) implantations using optical coherence tomography (OCT) in patients with STEMI. Sixty-three patients who had primary emergent percutaneous coronary intervention (PCI) with CoCr EES (42 patients) or CoCr BMS (21 patients) were enrolled in this study for 3 years. OCT was performed just after, 2 and 12 weeks after EES or BMS implantations. Time-serial changes in the neointimal coverage (NIC), the neointimal thickness, and malapposition of stent struts were evaluated. NIC of stent struts did not differ between CoCr EES (23.2%, 99.4%) and CoCr BMS (24.0%, 97.8%) at 2 weeks and 12 weeks after PCI, respectively. Thicknesses of the neointima on the stent strut was significantly thinner in CoCr EES (34.0 ± 13.8, 107.0 ± 32.4 µm) than in CoCr BMS (40.0 ± 14.6, 115.7 ± 33.8 µm) at 2 weeks and 12 weeks after PCI (p = 0.011, p = 0.008), respectively. The malapposition did not differ just after PCI, and was completely resolved at 12 weeks after PCI in both groups. Thrombus was significantly less in CoCr EES than in CoCr BMS at 2 weeks (19.0% vs 42.9%, p < 0.01), and decreased over time in both groups, but at 12 weeks, disappeared only in CoCr EES (CoCr EES: 0% vs. CoCr BMS: 4.8%, p = 0.56). This study demonstrated that NIC and apposition of the stent struts almost completed at 12 weeks after EES and BMS implantations, while the neointimal thickness on the stent struts were thinner in EES than in BMS. Moreover, thrombus was significantly less in EES than in BMS implantations 2 weeks after PCI, which may explain the lower rate of acute and subacute stent thrombosis of EES compared with BMS. The online version of this article ( https://doi.org/10.1007/s00380-018-1287-1) contains supplementary material, which is available to authorized users.